On January 7th, 1934, illustrator Alex Raymond introduced newspaper readers to Vale graduate Flash Gordon who was on the verge of entering a strange new world beyond the final frontier. Circumstance thrust Gordon and Dale Arden into an alliance with rogue scientist Hans Zarkov that would take them to Mongo, the alien world ruled by Ming the Merciless. 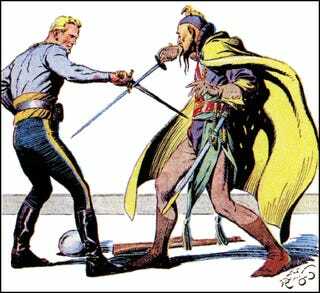 King Features Syndicate wanted a rival to defrosted space pilot Buck Rogers and originally set their sights on Edgar Rice Burroughs’ Martian adventurer John Carter. That plan fell through and they turned to staff artist Alex Raymond to devise a brand new comic strip. His first attempt was rejected. He was partnered with writer and editor Don Moore and Gordon made his debut alongside Jungle Jim. Raymond’s fine lines, classic anatomy and swashbuckling adventure proved a hit with newspaper readers around the globe and in 1936 Universal Pictures commissioned a 13-part movie serial based on the comic strip. Olympic swimmer Clarence “Buster” Crabbe played Flash while Charles Middleton played Ming. Crabbe would play Flash Gordon in three such serials, Flash Gordon (1936), Flash Gordon’s Trip To Mars (1938), and Flash Gordon Conquers The Universe (1940). The serials have been re-edited multiple times as stand-alone films with various titles such as Rocketship, Space Soldiers and The Purple Death From Outer Space. Crabbe also got to take a busman’s holiday playing Buck Rogers in a 12-part movie serial. He blacked his hair to distinguish Buck from Flash. Budgets were low and reused material from the Flash Gordon serials. Larry Crabbe as Buck Rogers. The serial has been re-edited into at least three different movies. One edit, Planet Outlaws can be found on Amazon Prime and YouTube. Crabbe bridged the generation when he appeared as General Gordon in Gil Gerrard’s television version of Buck Rogers, hinting that he had been around much longer than young Anthony. The mantle of Flash was picked up by Steve Holland in a 1954 tv series which made extensive use of World War II ruins in West Berlin. Fascinating in its tediousness. There are a number of animated Flash Gordons. Filmation made a fai stab at the character with their movie length Flash Gordon: The Greatest Adventure of All (which seems to have rotoscoped sequences from the Steve Holland show). Filmation also gave us the earnest (New Adventures of) Flash Gordon. The 1979 cartoon was a reaction to the success of Star Wars. And in 1989 a spirited upstart in the animation field, Marvel Productions gave us Defenders of the Earth, teaming Flash with other King Features characters, The Phantom, Mandrake, and Lothar. Is that Stan Lee singing? But if you thought Defenders of the Earth was awful, try Sci-Fi’s 2007 tv version of Flash Gordon. They made Smallville refugee Eric Johnson into Steven “Flash” Gordon who pops back and forward to Mongo via portals. So bad it is ... well, bad! This French take on Gordon, “developed” by Bill Shatner’s favourite collaborators Judith and Garfield Reeves-Stevens, also tests the patience. Which kind of goes to prove there can be only one ....! Wait! Right band, wrong movie, but you get the point? Gordon’s alive! Ah, aaaaaaahhhhh! Take a bow Mr Jones!